Today's hike was first and foremost a tribute hike. Lt. Col. Todd Clark was tragically killed in Afghanistan on Saturday June 8th. He and 2 others were killed on that day. Today was the ideal day to do this hike. Flags in New York State were at half mast today in honor of the fallen soldiers. We have our freedom because of soldiers such as Lt. Col. Clark. 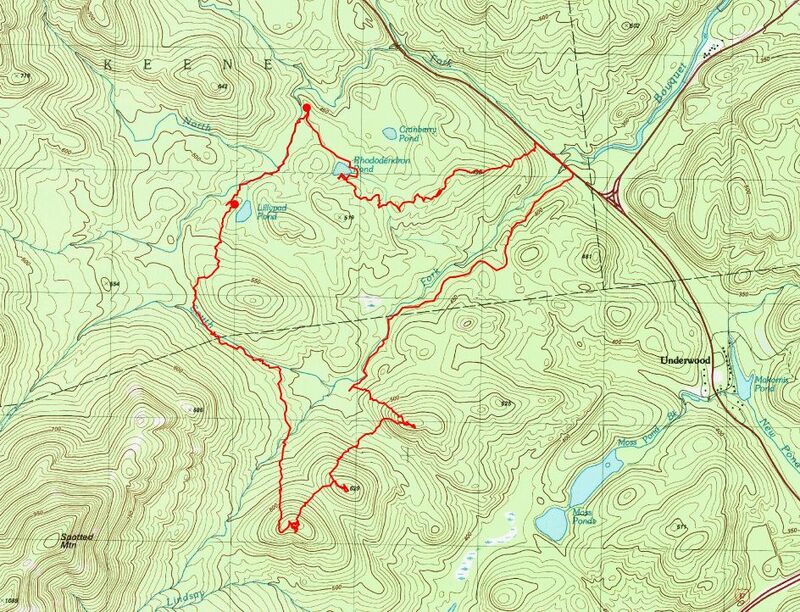 My destination was 3 small peaks known by some on the ADK High Peaks Forum as "The Three Gems". They lie just east and northeast of Spotted Mountain in the Dix Mountain Wilderness Area of the Adirondack Park. I had not climbed these hills before. 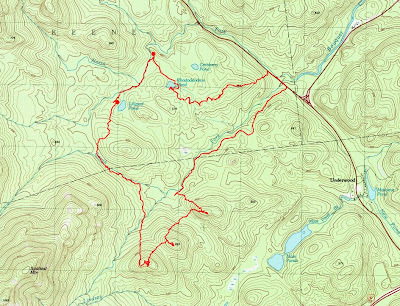 I started on Route 73 and headed SW following a herd path just south of the South Branch of the Boquet River. After 2 miles, I passed a designated campsite and knew it was time to turn SE and climb the first of the Gems. Once on the First Gem, I again worked my way SW onward and upward; each Gem being higher than the last. All three have fine open rock summits, but the southern most highest Gem by far has the best views. Looking at the summit of "Clark Peak"
I decided that I would call this peak, Clark Peak, in honor of Lt. Col. Clark. I said a prayer for him, his family, and the others killed last Saturday. I will always think of this peak as "Clark Peak". He would have deserved as much. A closer look. Noonmark, Round, Giant and Rocky Peak in the background. Walking around the summit I came across a nice 4 point deer antler. I kept looking around and soon found the other one! I've never found a pair before; always just one. It made me wonder if by any chance, Lt. Col. Clark was a deer hunter. I found a pair of antlers on the summit! I spent an hour on the summit before heading down. I crossed an unnamed feeder to the South Branch Boquet River. Soon I came to the South Branch itself and followed it upstream, heading NW. Eventually I turned N-NE to head for Lilypad Pond. After Lilypad Pond, I followed the N. Branch Boquet River before turning SE to go to Rhododendron Pond. After Rhododendron Pond, I went east then NE to return to Route 73 and back to the car. At this point I was getting attacked by a few persistent deerflies. They are never pleasant. I felt good about doing this hike and dedicating it, along with the beautiful 3rd Gem hill to Lt. Col. Clark as Clark Peak in my mind. May he rest in peace. I thank him for his outstanding service to our country. This is a very moving post, and Clark Peak is beautiful, a fitting tribute. As always, terrific photos! Your mystery flower is pink corydalis (Capnoides sempervirens), also called rock harlequin. Thanks for identifying this flower for me and thanks for reading! Great exploration, and a nice tribute. That's a terrific area out there. Open ledgy knobs, beautiful streams, a couple of ponds - an ideal day! Thanks for sharing.